To a dedicated mountain biking enthusiast, spending a fortune on a high-quality bike is well worth the investment. But if you’re just getting started or working on a tight budget, spending a thousand dollars on a bike isn’t always feasible. Luckily, there are some great options to get you started. The best mountain bikes under $500 let you hit the trail without breaking the bank. With a market flooded in cheaper bikes with less-than-stellar parts, finding that diamond in the rough can be a daunting task. You want a bike that will hold up to the rigors of a mountain trail. It’s important to know what to look for when searching for that perfect bike. To help you on your search, here are some great options under $500. With a price tag of about $350, this bike from Gravity is perfect for the budding mountain biker. The frame is made from durable aluminum and comes in sizes that range from 15 inches up to 21 inches. It’s a dual suspension bike that can perform well on variable terrain. Furthermore, the suspension system is fully adjustable. You can easily fine-tune the system to get the smoothness you want. Light double-wall rims keep the weight down while disc brakes on both wheels let you stop at a moment’s notice. The Shimano shifters provide you with 24 speeds for versatile performance. This bike from Diamondback Bicycles is made for performance. It features a durable and lightweight frame made from an aluminum alloy. It has a single pivot design with sealed cartridge bearings. The unique design feature allows for smooth operation, regardless of where you’re riding. To help further minimize bumps, the bike has a dual suspension system that provides up to four inches of travel. Instead of a traditional rear shock, this bike utilizes a Kindshock coil to get over bumps. Mechanical disc brakes are used for safety. The bike has large 27.5-inch wheels and has an 18-inch frame size. Despite a low price tag of under $300, the Mongoose Impasse has a number of great features to improve your safety and performance. 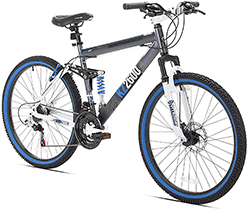 To help you control speed on the trail, the bike uses front and rear brakes made from a durable alloy. The same material is used on the wheel rims. The frame itself is made from aluminum while the wheels measure 29-inches high, making it perfect for taller guys. A full suspension system is used to absorb the shocks of the trail. A suspension fork from Element is on the front while a coil is used on the back. A Shimano derailleur with twist shifters will provide you with ultimate control. Available in four different sizes, this bike is suitable for a variety of different heights. 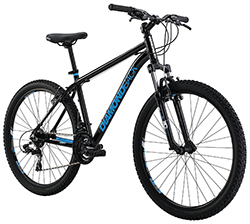 It uses large 29-inch wheels for precision, control, and traction as you navigate the trail. The frame is made from an aluminum alloy. It’s custom formed to achieve a very strong build without adding much weight. The bike is a hardtail and features an SR Suntour suspension fork on the front wheel. The front suspension gives you comfort and control. Even with its relatively low price tag, the bike utilizes great components, such as the Tektro mechanical disc brakes and Shimano drivetrain. If you plan on visiting moderate trails or ride downhill, take a look at the Schwinn Protocol. It features an aluminum frame with a comfortable dual suspension system. The suspension will ensure that the shock from small bumps and rocks don’t transfer to your shoulders or back. When it comes to braking power, the bike utilizes both a disc brake and a pull brake. The disc brake is located on the front wheel while the linear pull brake is on the back. They combine to provide you with strong stopping power and control. 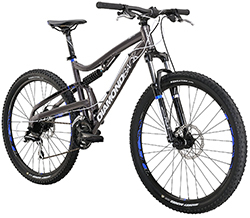 Durable components from Shimano and Promax ensure that the bike is reliable and efficient. This is another great option from Diamondback Bicycles. However, this option is a hardtail made for riders that want a bit more control. 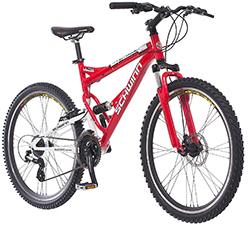 The aluminum frame is durable enough to put through the ringer on a mountain trail and sleek enough to ride on the street. It features a fork suspension on the front to improve the smoothness of your ride. A simple rim brake is used on the rear. It’s adjustable to get better control. It’s a simpler option that’s perfect for beginners that want to learn. With numerous sizes available, you can easily get an option that you’ll be comfortable riding. The Thruster mountain bike from Kent is very affordable. With the high-quality build and components from popular brands, it’s a great option for any rider on a budget. The 26-inch frame is made from aluminum. There’s a unique full suspension system for comfort. A suspension fork provides about 2.5 inches of travel on the front while a coil located under the seat absorbs shocks from the back. The bike also uses two different types of brakes. A disc brake controls the front wheel while a simple linear pull brake takes care of the rear wheel. A 21-speed Shimano shifter and derailleur are used to provide you with a versatile riding experience. There are some tradeoffs you should expect with a lower price tag. 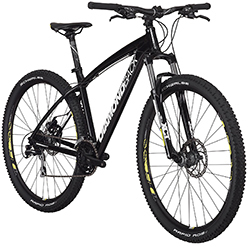 These types of mountain bikes are often regarded as entry-level options. Their build and features are ideal for those just getting started in the sport, so experienced riders may notice these differences straight away. When you’re on a mountain trail, weight can have an effect on your performance. More expensive options are built with light carbon fiber materials. Unfortunately, these materials come at a cost. Affordable bikes have a frame that’s typically made out of aluminum. It’s noticeably heavier than more expensive bikes. Steel is another option, but it is much heavier than aluminum. At this price point, aluminum is your best bet. To keep costs down, manufacturers will utilize cheaper parts on the bike. This includes everything from wheels to chains. While bike makers will use more affordable parts, that doesn’t mean you don’t have options. It’s good to check the quality of the parts to ensure that they’ll work with your needs. In addition, you should look for recognized brands for quality assurance. Because your bike will have lower-end parts, it will need a bit more upkeep than an expensive option. The various components will need servicing, but that isn’t necessarily a bad thing. More maintenance can help you learn the ins and outs of the bike as you improve your skills. With a more affordable bike, you may find that you’re somewhat limited in the types of trails you can ride on. With a heavier frame and cheaper parts, you may want to stick with calmer trails. You can certainly take your bike on aggressive paths, but doing so would put more wear and tear on the parts than normal. When you’re shopping for a bike, there are few things you need to consider. The selection process should be about more than choosing the cheapest or flashiest option. To remain safe while getting the best performance possible, consider the following factors. What kind of trail do you plan on riding? This is an important question to ask because certain components and design features are more suited to specific riding conditions. Certain bikes are made for riding sharp inclines while others are made for simple off-road trails. Hybrid bikes are great for trails that don’t have many obstacles to get over. They can be taken on hard pavement roads or flat dirt trails without any problems. If you plan on riding over more diverse trails with multiple obstacles, you are better off with a full suspension or hardtail bike. Having a good idea of the terrain you’ll be riding will help narrow down your choices dramatically. When you’re looking at bikes, you’ll notice that bikes are labeled as full suspension or hardtail. This refers to the suspension system used on the bike and its shock-absorbing capabilities. The type of system used should be chosen based on the terrain you’re on and your riding style. 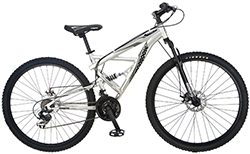 Full suspension bikes, also referred to as dual suspension bikes, feature a suspension system on both the front and back wheels. They’re perfect for rocky or bumpy trails. They’ll absorb the shocks of the trail and provide you with a smoother experience. Hardtail bikes have a single suspension system on the front wheel. The rear wheel is solid. This type of bike is traditionally used by experienced mountain bikers. The front suspension is enough to absorb the shock from getting over obstacles while the hardtail gives you more control as you perform technical maneuvers. With the information about the trail terrain in mind, you can choose a brake system that will provide you with safety and security. Rim brakes are the most common and have been used on bikes for years. With the press of a hand clutch, the brakes apply pressure to the side of the wheel to bring it to a stop. While effective on relatively flat and smooth terrain, they aren’t that great for hills and fast speeds. Disc brakes are a newer option that applies pressure to the rotor. They are more complex than standard rim brakes and provide much more stopping power. Disc brakes provide you with more security and are better suited for more intense trails with many obstacles. Mountain bikes come in a variety of different sizes. While it may not seem like a huge deal, even a few inches of extra room can make a huge difference in your comfort and performance. Sizes aren’t limited by price, so you shouldn’t have a problem finding an option that suits your body. The trick is understanding how your height relates to the bike size you need. Larger guys that are 6’4″ or taller will need a bike that’s at least 24 inches. This measurement refers to the height of the bike frame. More specifically, it’s the length of the seat tube to the bottom bracket to the top tube. If you’re between 5’11” and 6’3″, try out a bike that’s 20 to 23 inches. 15 to 19-inch bike frames are great for guys that are between 5’3″ and 5’10” tall. Your height can give you a better idea of the range of bike sizes you’ll need, though you can still make slight adjustments to get the perfect setup. You don’t need to spend a fortune to experience the thrill of mountain biking. The best mountain bikes under $500 can get you started in the sport. They’ll serve you well as your skills improve. While they won’t have all the bells and whistles as a bike twice the price, they’re a great investment you’ll use time and time again. How to Ride with Clipless Pedals ..
Classic & Skate Style Roller Skis, Which are Best for Beginners? How to Handle Snakes in a Safe and Controlled Manner..
Polarized Sunglasses vs Regular (tinted) What’s the Difference? Waterproof Golf Shoes,… Which Ones are Best? Follow Hix Magazine - Everything for Men's board Sports and Games for Men on Pinterest.